Hi there. I’m back with another delicious, no-bake dessert that has only 5 ingredients! Yep. Chocolate chips (I like semi-sweet), peanut butter, unsweetened shredded coconut, rolled oats, and sea salt are all the ingredients you’ll need to make this. When these ingredients are combined together, it results in a treat that tastes sweet, salty, and nutty! The textures are wonderful too! 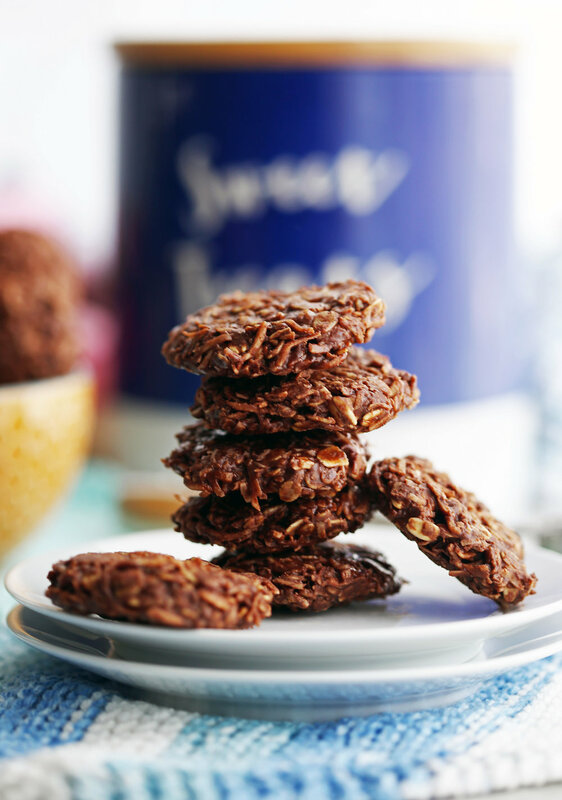 The melted chocolate and peanut butter is creamy and melt-in-your-mouth while the oats and coconut give the cookies a pleasant chewy yet soft (and easy to eat) texture. All the ingredients! Full amounts and instructions in the recipe card below. So easy to make in a non-stick skillet or frying pan! It's now ready to be scooped and molded into the shape of your choice. These cookies take very little time to prepare. All you do is melt the peanut butter and chocolate chips together and then mix in the remaining ingredients to combine, scoop onto a baking sheet, shape it into a regular cookie shape (e.g. like a flat disc) or balls or whatever you really want. TIP: when you shape the cookies, make sure that you slightly wet your hands, it will help prevent the mixture from sticking to your hands. No-Bake Peanut Butter Chocolate Crunch Bars: This one is really similar to this recipe! I can’t get enough of the peanut butter and chocolate combination. It’s always been one of my favs. Chocolate Marshmallow Puffed Wheat Squares: These squares are tasty, soft, and chewy! Its texture is similar to a rice krispies squares! Peanut Butter Butterscotch Marshmallow Bars: Also known as confetti bars. This is a regional Canadian dessert and one of my husband’s childhood favorites. It’s basically a peanut butter butterscotch fudge with marshmallows! 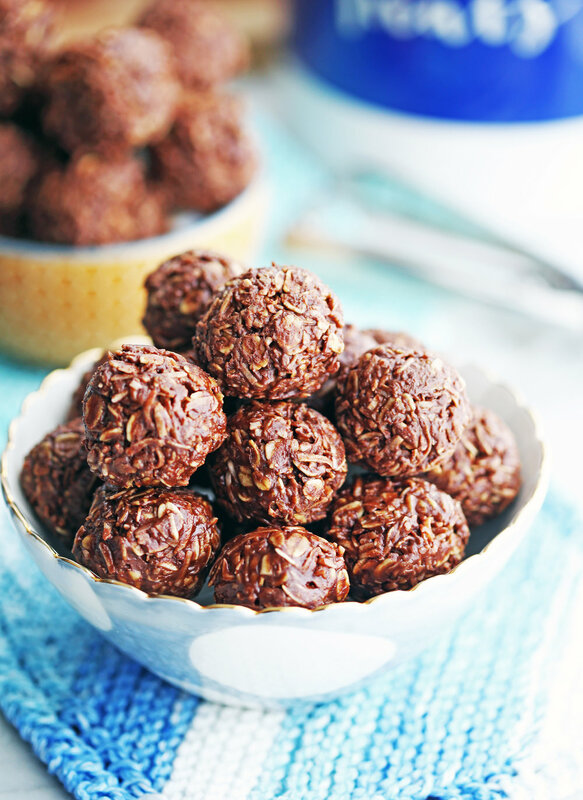 No-Bake Chai Spiced Date Energy Balls: Medjool date energy balls loaded with Chai spices, oats, and dried fruit. Also, these scrumptious bites are vegan-friendly and gluten-free too. If this is of concern to you, just make sure that the ingredients don't have additional additives that would indicate otherwise. For example, choose chocolate that is free of dairy products and peanut butter that doesn’t contain any animal products like honey. Plus, these little snackable cookies are really easy to pack up, take-on-the-go, and share (or not… I’m not judging). Just note that these cookies will soften over time as it sits at room temperature. The best place to store leftovers are in an airtight container in the refrigerator or in the freezer. Speaking of sharing, my husband frequently brings leftovers from my recipe testing into work. I told him to bring the two containers of these cookies that we had stored in the freezer. Somehow, he *mysteriously* only took one container in on the first day. He says he didn't see the other one, but I think he wanted them all to himself. In a large non-stick skillet (or saucepan) on medium-high heat, add in the chocolate chips and peanut butter. Whisk until the mixture is completely melted and uniform in texture. 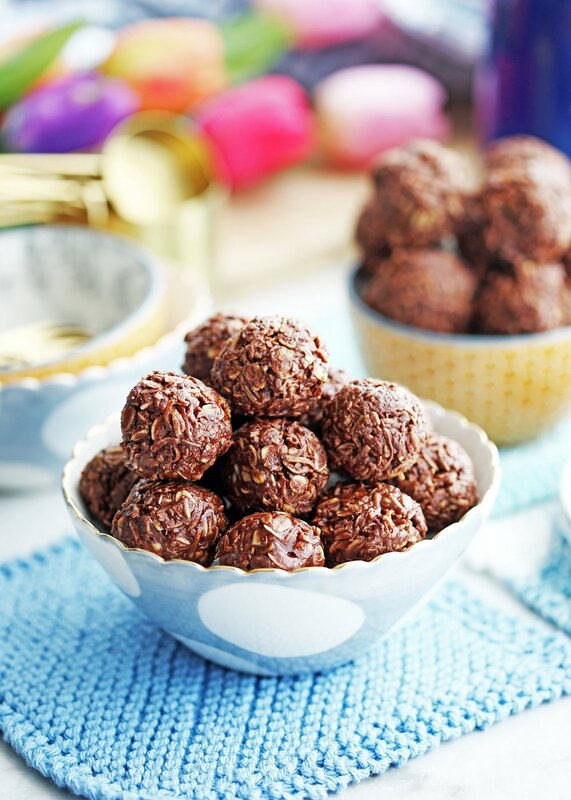 Remove from heat and stir in the rolled oats, shredded coconut, and salt until the ingredients are well-coated with the melted chocolate and peanut butter. Line a large baking sheet with parchment paper or aluminum foil. Using a small cookie scoop *(see first note), scoop the mixture and place it on the baking sheet so that the scoops are not touching. Using slightly wet hands (so the mixture doesn’t stick to your hands), shape each scoop into your desired form such as a ball, flat cookie, or leave it as is. Freeze for 15-20 minutes, until set. Enjoy! *I used a size 50 cookie scoop, which holds 1.28 tablespoons to make small cookies or balls. You can also use a tablespoon measuring spoon and scoop out a heaping amount or just eye-ball the amount and size of cookie you want. Store the cookies in an airtight container in the refrigerator or freezer. Nutritional calories represents one cookie for a total of 30 cookies.